Today’s kids spend more time in passive play than ever before. They choose to watch television, play video games, and surf the internet on their laptops or using a mobile device. While this is beneficial to some parents, the Child Development Institute warns that this cuts their time for a more important activity — physical play. There’s no better place for kids to play than in their own family backyard. Physical play usually occurs outside, where children can release their energy with their liveliness. At this stage of their development, they should be engaged in daily physical activities that promote health, fitness, and movement skills. In a previous post, Dr. Ayala Miller challenged you to limit your child’s access to your smartphone and tablet and to engage them in physical play time. In this one, we’re going to help you make it happen. Here are some things you can do to make a fun-filled family backyard. Depending on the size of your backyard, you may be able to only do a few of these things. If so, keep your child’s age in mind. You may start with one thing and change it in a few years as your child outgrows one activity, like a sandbox, and grows into another, like basketball. There’s something about the green and grassy backyard that’s a magnet of unencumbered imaginative and active play. With space to run around in and trees to climb, your kids can experience a more relaxed childhood. When you’re blessed to own a backyard like this, do not hesitate to string up a hammock or hang a swing chair. This way, you can relax as you watch your kids play under the sun. A paved backyard is an ideal and safe play space especially when your kids are riding their toddler bikes and trikes. The hard and seamless underfoot is also a flexible space for them to play outdoor games like hopscotch and tag with other kids. Sensory gardens aim to engage a person’s five senses. Stimulate your sense of sight, smell, taste, touch, and hearing with different kinds of plants and garden decorations. If you are planning a garden as a teaching tool for young children, keep your plant beds and grow plants that are within their reach. Engage them by letting them smell flowers, dig soil, tend to plants, harvest fruits or vegetables etc. This is an amazing activity to enrich their childhood. Water features like fountains and artificial ponds and rivers enable you to have aquatic and semi-aquatic plants growing in the garden. Populate it with small fishes and tiny turtles for your children to take care of. Surely, they will spend hours watching them swim. Also, running water cools the garden down and make it a pleasant place to enjoy on a hot summer day. The sound of trickling water also creates a tranquil sound too. In order for your artificial water feature to have a cooling and blissful effect, the water used needs to be crystal clear and clean. Maintenance is a must here. Let your child’s imagination run wild by introducing them to their secret hideaway. It can be a tiny tent, a cubby house, a timber fort, or a tree house. Any of these backyard additions can attract other kids to be their playmates. When they grow up, their cubby (like below) or tree house can later be converted into a hangout area for tweens. Consider installing a basketball hoop, a net, or a cricket pitch outside to encourage your family to play active sports. You don’t need to recreate a court in your backyard. Having a space wide enough for them to practice is enough. If the space permits, build a pool. Having a swimming pool on your property is a great way to keep everyone in the family cool and active during the hot summer months. It is a place where your kids can hang out with their friends. Make sure that your pool follows the safety measures in line with the local planning authorities. Deep pools must have a fence around it to prevent accidents involving small children. Also, always provide adequate adult supervision when kids are in the pool area, even if they aren’t in the water. Protect your kids from the harsh sun by shading a significant part of your outdoor living. Incorporate built-in and permanent shade, a retractable awning, or use a patio umbrella over your seating and recreational areas. A sandbox is a popular playground item that you can recreate in your own backyard. It’s an afternoon project! Simply create a square frame out of lumber and fill it with sand. Your toddler will enjoy it so much. Don’t forget to cover your sandbox when not in use or else wandering cats will use it as a litter box. When your kid outgrows the sandbox, upcycle it into a small herb or vegetable garden. Make your backyard escapades more ecstatic a trampoline. There are above-ground trampolines which you can buy off the shelf. But if you’re feeling quirky, go for an in-ground trampoline. There are trampoline companies that carefully install them in your backyard without ruining your landscape design. Intrepid home and garden designers can help you incorporate these fun features at home to entertain your kids. 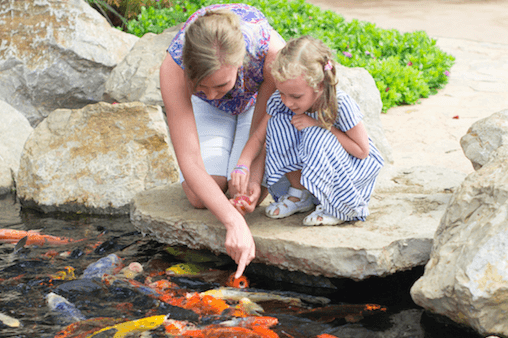 Whether you have a small courtyard or a wide garden, there is something you can do to motivate your family to spend time outdoors. We hope these clever ideas inspire you to build spaces that you and your kids will love to use. Anything that gets kids outdoors and away from electronic devices is always a good thing.